Ola, well, I'm sleepy. But I wanted to put up another picture of my goofy cat so I thought I would write something here. Hmm, well actually, I think I'm really sleepy so I think I'll just go to bed and put a pic up tomorrow. Yep, that's a baby. I don't know what more to tell you about him/her except that it is there in the middle and clearly marked for all to see. 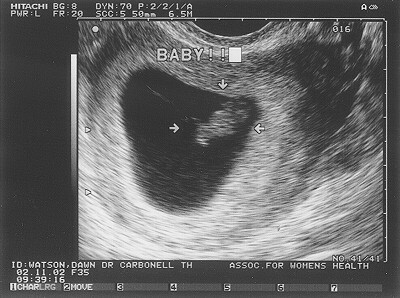 You can kinda tell when the ultrasound girl was going to give us a pic because she only really labeled those (well, except for the ones of Dawn's overies which didn't look like my of anything at all to me. Um, another one. Uh, baby is marked in the middle. 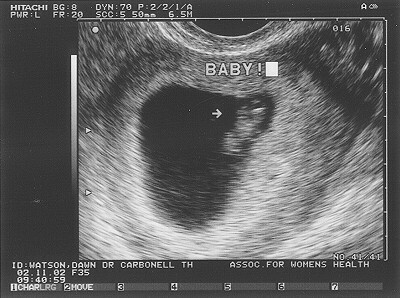 OK, this one is labeled a little more (thank you ultrasound lady). Don't know if you can really tell those are arms and legs, but apparently they are. 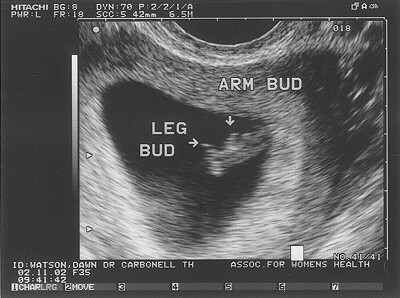 I'm using blind faith thing with these because I don't have a clue what an arm bud looks like in an ultrasound. This was the one that actually got both of us a little choked up. 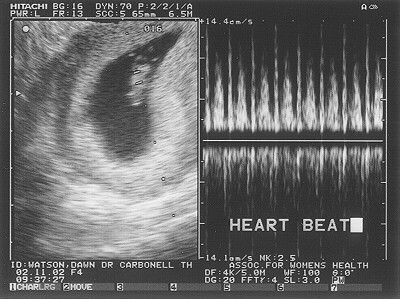 The baby's little hardbeat was going 146 (or so) beats per minute and both Dawn and I talked about it later as being the emotional part of our visit. It was interesting because she let us hear it while she was recording it. The current due date was set for 09/27/02. Which will kinda put a damper in our anniversary plans, but I'm sure we will get over it. The original due date (based on other stuff) was set for 09/22/02 which IS our anniversary. Morning Sickness actually can last all day!!! Well, in case you haven't already heard Dawn is having no fun with the morning sickness thing. We've only been to the hospital once in all this, but that wasn't any fun either. We probably should have waited, but now I know. Anyway, most days are sorta OK, but the last 3 weekends Dawn has had 24-48 hours where she can't keep any food down at all. We've been through all the anti-nausea drugs (well, probably just the ones that are OK for pregnancy) and for the most part Zofran seems to be helping out the most (although not a cheap drug at about $15-$18/pill). Oh the fun, oh the excitement. Anyway, other than that we are having all kinds of fun and no we haven't gone through the baby-names book yet, but we will soon.